Feel unabashed to flaunt your style by wearing this shirt from Rare. Made from good quality fabric, it will provide you with immense comfort throughout the day. 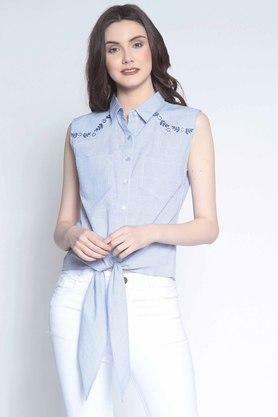 Featuring a collar and embroidered pattern, this sleeveless shirt possesses a fashionable appeal. Head to any casual outing in style by wearing this shirt will be an excellent pick for you to wear on a casual day out. It will look good with a pair of faded jeans and wedge sandals.